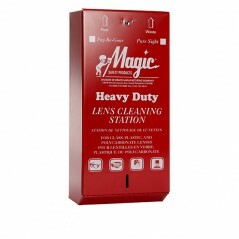 The Magic Heavy-Duty Metal Lens Cleaning Station keeps plastic and glass lens cleaning supplies organized and ready to use. Sturdy, lockable unit holds two packets of 760 wet-strength wipers (851T) and one 16-oz. bottle of Pure Sight or Fog-Be-Gone lens cleaning solution. - This metal station keeps plastic and glass lens cleaning supplies organized and ready-to-use.